Que blog útil e gostodo parabéns . You guides are great! They have such great variety. I'm going to have to go shopping! omg, you have to get the dog one! 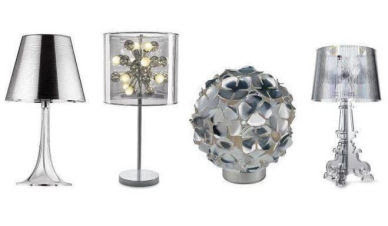 I'm looking for table lamps now and your guides are so helpful. Thank you! You have impeccable taste. grace, we've had the larger version of nicholas furrow's red light district lamp for about a year, and i must say - it's my husband's favorite thing in our whole apartment. the light is VERY red, so its utility as a desk lamp is kind of questionable, but as an atmospheric piece, yeow! it's off the charts. 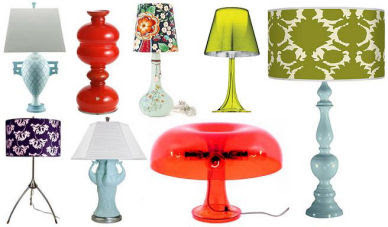 i think nicholas made a few green versions when he first started with the lamps (dave at the future perfect had a few), but there must have been fewer of those vintage shades - i haven't seen that version in years. i bet those would be beautiful as well. I'm confused - slide 9 seems to have 8 lamps and only 7 listed in the description. love your guides! love your site! this is a timely guide for me too. hmm...slide number eight has eight lamps and eight sources, slide nine has seven lights and 5 descriptions because the little trio of mibo lamps is all a variation on one lamp- the link goes to the lamp with the different shade options. did you mean a different slide? ah! you mean the affordable lighting guide. slide number nine IS missing one, you're right. so sorry, i'll fix that next week when i go to the office. that piece is from target as well. Thanks so much for this guide. The lamp without a lampshade next to my living room couch has been taunting me since I moved in 2 months ago. 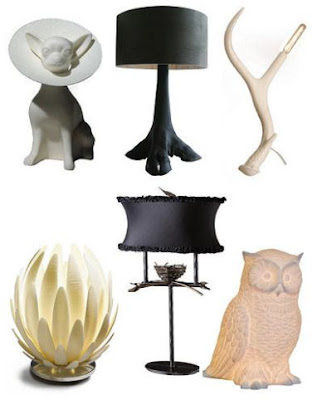 However, a floor lamp has taken me weeks and I still haven't found one I really like.